Avalanche Studios is attempting to address some of players' issues with Just Cause 3 today via a series of gameplay notes and a new software patch. The 1.02 patch, weighing in at 132MB, sports the usual litany of bug fixes and performance enhancements, most notably "significantly improved loading times." It will be going live on consoles over the next couple days, eventually hitting PCs on Friday. Meanwhile, the studio also addressed a couple of issues players have raised concerning the sequel's gameplay. Regarding the lack of sprint function, Avalanche says that its intent "was to encourage you to use Rico’s unique grapple to move around Medici far quicker than his legs would allow, as well as giving you the ability to traverse vertically." Similarly, the lack of crouch is designed to make players get into the air instead; "Rico is far more deadly in the skies, than pinned behind a container on the ground." 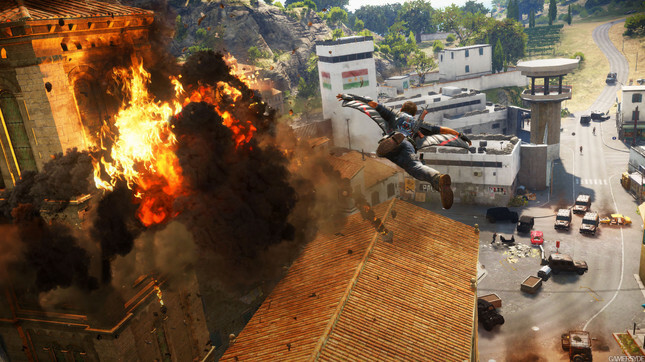 Just Cause 3 is available now on new-gen consoles and PC. I'm in the middle of a chain reaction.